If you'd like to learn more about CDO come to the EclipseCon Europe next week where I'll give a session on CDO for Application Programmers. I'd be happy to meet you there! Of course there will be an interesting line-up of demo sessions and hopefully many other Eclipse users and makers to talk to. I'll be showing how to install preconfigured Eclipse IDEs and how to quickly customize them to your specific needs with Oomph's Eclipse Installer. In any case, please help us to make this a great event by spreading the word to your friends and colleagues in or near Berlin! Now with CDO 4.4.1 the documentation has been augmented with a beautiful User's Guide and an extensive Operator's Guide. Please browse the release notes to see what else has changed. Download CDO 4.4.1 and enjoy the best CDO ever! The java.uti.concurrency package comes with a whole bunch of classes that can be extremely useful in concurrent Java applications. This article is about the ThreadPoolExecutor class, how it behaved unexpectedly for me and what I did to make it do what I want. 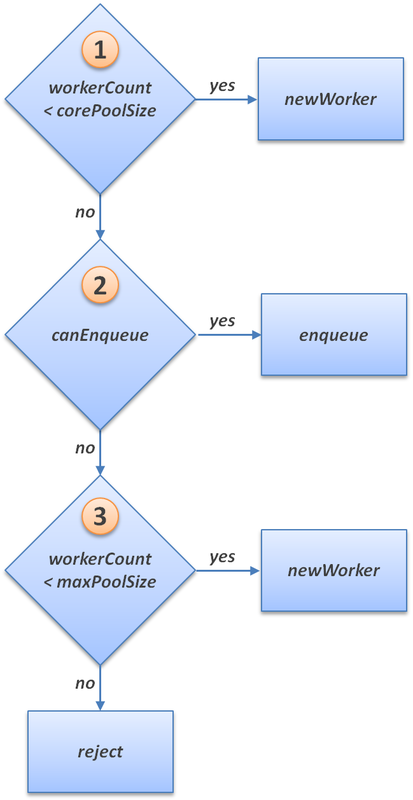 The corePoolSize defines kind of a minimum number of worker threads to keep in the internal worker pool. 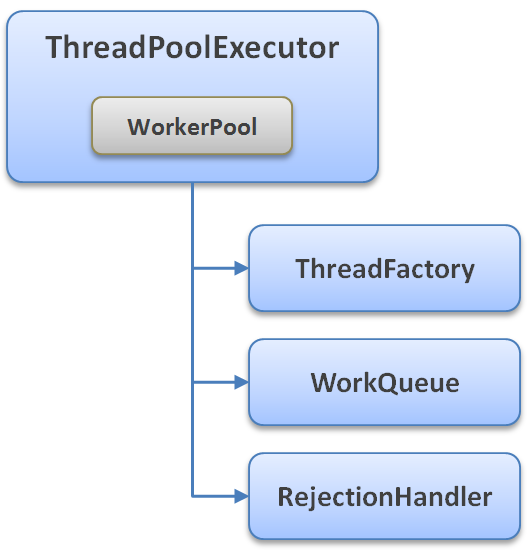 The reason it's not called minPoolSize is probably that directly after the creation of the thread pool the internal worker pool starts with zero worker threads. Initial workers are then created as needed but they're only ever removed from the worker pool if there are more of them than corePoolSize. The maxPoolSize defines a strict upper bound for the number of work threads in the internal worker pool. The keepAliveTime defines the time that an idle worker thread may stay in the internal worker pool if there are more than corePoolSize workers in the pool. 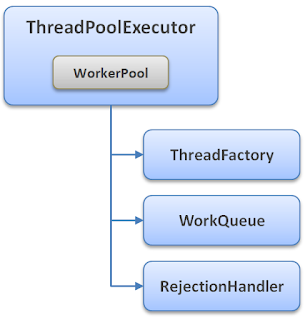 The Javadoc of the ThreadPoolExecutor class recommends to use the Executors.newCachedThreadPool() factory method to create a thread pool. The result is an unbounded thread pool with automatic thread reclamation. A look at the code of the factory method reveals that corePoolSize=0 and maxPoolSize=Integer.MAX_VALUE. The work queue is a SynchronousQueue, which has no internal capacity; it basically functions as a direct pipe to the next idle or newly created worker thread. When you hammer this thread pool with lots of tasks the work queue will never grow; tasks will never be rejected because the worker pool is unbounded. Your JVM will soon become unresponsive because the pool will create thousands of worker threads! What I really wanted is a thread pool with, let's say, maxPoolSize=100 and a work queue that temporarily keeps all the tasks that are scheduled while all of the 100 threads are busy. So I instantiated a ThreadPoolExecutor directly (without the recommended factory method), passed in corePoolSize=10, maxPoolSize=100, and a LinkedBlockingQueue to be used as the work queue. And here comes the big surprise: This thread pool never creates more than corePoolSize worker threads! Instead the work queue will grow and grow and grow. The tasks in it will always compete for the 10 core workers. Why is that? enqueue is always preferred over newWorker! That means that, with an unbounded work queue, no more than corePoolSize workers will ever be created; maxPoolSize becomes completely irrelevant. Now we have seen one pool configuration that only ever creates new workers (the default) and one that only ever enqueues tasks. Between these two evils is probably the a thread pool with both a bounded worker pool and a bounded work queue, but obviously such a thread pool will reject tasks when hammered enough. I control the work queue implementation! Peeking again at the code of the execute() method shows that the only interaction between the thread pool and the work queue here is the call workQueue.offer(task) and per contract this method returns whether it accepted the offer or not. So, the simple solution to my problem is a BlockingQueue implementation with an offer() method overridden to accept the offered task only if the worker pool contains less than maxPoolSize threads. Subclassing LinkedBlockingQueue would do that trick but there's a small problem remaining now: The three conditions (see above) are checked in the execute() method of the thread pool without any synchronization. That means, if my work queue does not accept a task because there are still less than maxPoolSize workers allocated the third condition is not necessarily true a nanosecond later. The task would be completely rejected from the pool rather than be enqueued. The solution to this problem is a custom rejection handler that takes the rejected task and puts it back at the beginning of the work queue. And now it becomes clear why subclassing LinkedBlockingDequeue is a better alternative: It provides the needed addFirst(Runnable task) method. 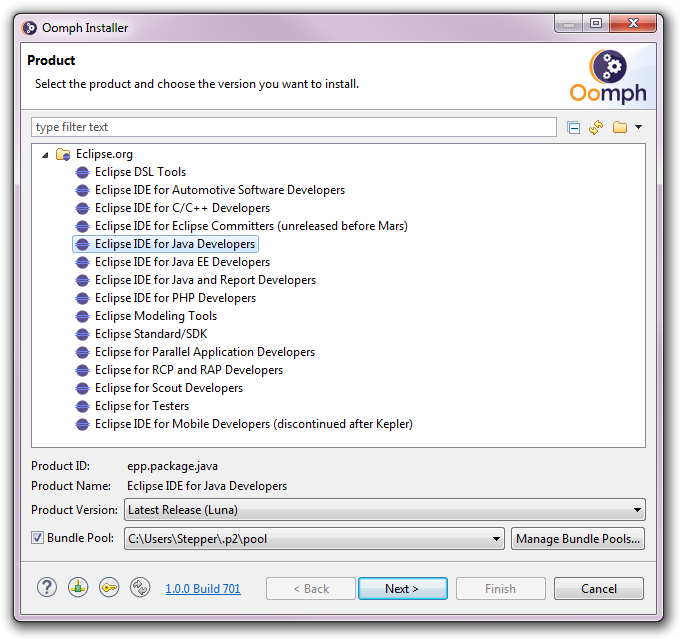 All you need is an Eclipse IDE with Oomph and our Author's Guide. Go to the "installers" folder and launch the installer for your platform. If you are on Linux, please "chmod +x" your installer binary first! Now you're ready to participate. We're looking forward to meeting you in Toulouse! I hope you like the new concepts and workflows. Feedback is welcome, of course. And I'd like to thank CEA, Kenn Hussey and Christian Damus for their help to make this happen! You can also install Oomph into an existing IDE via the update site or the site archive. Our help center is still work in progress but you may already find answers to your questions there. Our wiki may provide additional information. I'd like to thank our committers, especially my friend Ed Merks, our contributors and early users for their great contributions, valuable feedback, and concise bug reports. Working with you has been and will continue to be an absolutely pleasant and rewarding experience for me. You like my open source software? How safe is a "thread safe" data structure? How Scalable are my Models? What exactly is inside that p2 repository?